Complex logistics systems are the foundations upon which global trade rests. But how do you develop the ideal warehouse solution for individual companies? How do automatic storage systems, palletising and recycling actually work? Students on the M.Sc. International Logistics & Supply Chain Management course at ISM Frankfurt discovered the right answers on a visit to the world’s leading solution provider. SSI Schäfer develops bespoke logistics systems for its customers and provides the necessary support, from planning through to project management and maintenance. At its Technology Centre in Giebelstadt, the German company not only tests its latest system and product developments but also presents state-of-the-art solutions ranging from storage and retrieval machines to driverless transport systems. The ISM students were able to gain in-depth insights into the logistics solutions and the underlying processes. 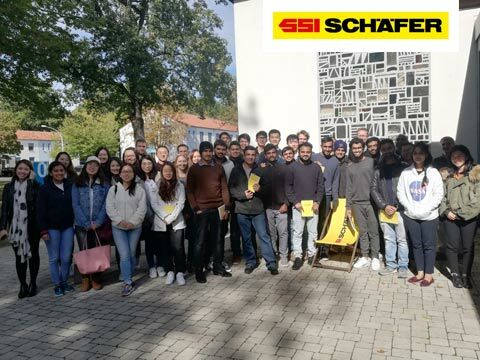 Corporate presentations also enabled the ISM group to learn more about processes and product management at SSI Schäfer. Needless to say, these practical insights help to make the logistics master one of the most popular courses at ISM. Due to the huge demand, especially from international students, the programme will also be offered at ISM Hamburg as of the winter semester 2019/20.